This review was originally tweeted in Real-time from the back row of a movie theater and appears @BackRoweReviews. Though efforts were made to tease rather than ruin this movie’s memorable lines and moments, some spoilers may exist in the following evaluation. The original tweets appear in black, while follow-up comments appear in red. For concerns over objectionable content, please first refer to one of the many parental movie guide websites. All ratings are based on a four star system. Happy reading! Vision, not gimmicks. The opposite of most entertainment these days. The imaginary arrangement that’s constructed around Knightley’s acoustic song is brilliant. I envy people with such musical mutant powers. The new song garners a slap from the mind reader. Never underestimate the power of women’s intuition. Record every song at a different location. A unique concept. And a logistical nightmare. Probably the reason why no one’s ever done it before. “Hold on” section with the kids is a nice moment. Well worth the $5 per kid for their services. Listening to Knightley’s playlist via a special splitter. Recreating a magical moment. This musical montage is the highlight of the film. The sequence is the audio/visual equivalent of a warm embrace. The kazoo solo is hilarious. I used to play one as a kid, but I’m out of practice. I need to get my chops up. A buck for a book is a risky proposition. An amusing coda. I love it when we get additional story during the end credits and not just silly outtakes. Final analysis: like Once, this is a song-centric film with strong character beats and fine performances. The songs Knightley’s character sings have a Norah Jones or Colbie Caillat quality to them and should prove listenable, and perhaps even enjoyable, for most viewers. Like the music it features, the film is a stripped-down drama that reminds us of what pure artistry really is. Rating: 3 out of 4. A charming turn by Knightley & a new career watermark for Ruffalo. Plus some catchy tunes. 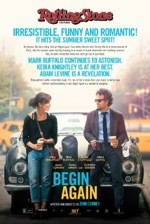 From director John Carney, who brought us the similarly themed and structured Once (2007), comes Begin Again, a dramatic and romantic movie that can’t really be classified as either. Nor can it be called a musical, despite the fact that it has just as many full songs as most musicals. Genre quandaries aside, what’s readily apparent is the movie’s easy manner and affable characters (and the picturesque location footage shot in NYC doesn’t hurt either). Besides its toe-tapping melodies, the film’s greatest asset is its deftness at avoiding standard rom-com clichés. For starters, there really isn’t a romance in the film since Knightley breaks up with her singer boyfriend, Dave (Adam Levine) and, thankfully, never hooks up with Ruffalo (eww!). The movie also does a good job of avoiding mawkish episodes: a scene near the end sets up the opportunity for an emotionally gratifying (and gratuitous) moment when Dave invites Knightley to the stage during a concert (the same exact scenario occurs when Hugh Grant coaxes Drew Barrymore to the stage in the 2007 film Music and Lyrics). Against our expectations, Knightley listens in the wing for a few minutes and then leaves. That’s just one example of how Carney (who serves as sole writer) diligently worked to keep his story free of contrivance. So then, no matter which genre Begin belongs to, file it in the feel-good music movie section, and those who stumble upon this indie winner will be completely satisfied. How many nuns does it take to place a statue of Christ? Asking this was probably in poor taste, but the scene just begged for such a jocular question to be posed. The answer is four. Ida is drawn to the Coltrane tune and the man playing the saxophone. Ida lets her hair down. A significant scene. A hint of what’s to come. Saving the bones is a bit macabre, yes? A snicker at supper. A sign that Ida isn’t ready for the “forever” nature of her impending decision? Not a Snickers for supper. Although, a candy bar would probably be more appetizing than what’s in that soup. Ida’s transformation is startling in its suddenness. It’s frightening at how rapidly and radically humans can change. Final analysis: a somber film about an orphan’s journey to discover the fate of her parents. Rating: 3 out of 4 stars. A moody period piece that greatly benefits from its beautiful B&W cinematography. This film is a quiet, unassuming character study centered on a young nun’s search for answers to her parents’ fate. More importantly, the movie is a quest of self-discovery as the woman searches for clues to her identity. Who is she and who does she want to be? These questions lie at the heart of a film where mood rules the moment and many of the film’s greatest revelations are subtly communicated through impressionist directing and minimalist acting. The actress who portrays Anna, Agata Trzebuchowska, delivers an understated performance that powerfully conveys a wide range of emotions with very little facial variance. It’s an extremely nuanced portrayal that’s made even more impressive by the fact that this is Trzebuchowska’s film debut. While the acting and writing are solid throughout, it’s Pawel Pawlikowski’s direction that elevates Ida to the upper ranks of the many fine films being produced by the European national cinemas these days. While the picturesque cinematography of the brooding, overcast Polish countryside and villages is stunning in its own right, Pawlikowski’s framing of his performers is simply sumptuous. In addition to employing radical angles in a handful of shots, Pawlikowski frequently pushes his characters to the extreme edges of the screen to produce tension and discomfort in the viewer and to reveal the inner turmoil of these marginalized and forgotten characters. In several of these shots, the director frames Anna’s disembodied head in the corner of the screen to signify the chastity inherent in her status as nun in training. Such thoughtful framing is subtly woven into the tapestry of the film and serves as a guide for interpreting the movie’s style, substance and subtext. Ida isn’t a phenomenal movie by any measure, but it’s well told and beautifully shot. If you can get past the subtitles and black and white filming, this movie is definitely worth watching. The redacted opening credits is a nice touch. Should be “are” instead of “is.” Eh. That last part is right up John Nash’s alley (reference A Beautiful Mind). One last longing look through the circular window. “My wife died here!” Superb acting from the man who brought Walter White to memorable life. Unfortunately, and uncannily, the very instant Cranston exits stage right the film gets flushed down the crapper. The old Godzilla mutated from radiation. This creature eats radiation. Consumes nuclear bombs whole. Wouldn’t chewing on a bomb cause it to explode in the creature’s face though? Destroying it and everything else around it in an expansive circumference? Terror in Vegas. The city will never be the same...the wages of sin. Boy, I hope Wayne Newton got out okay. Shine your flashlight right at the creature. Great idea. These trained soldiers are no smarter than the kids in Jurassic Park when they shine their flashlight right into the T-Rex’ eyeball. Actually, the kids are smarter…at least Tim tries getting panicked Lex to turn off the flashlight. Trained soldiers should know better. Nitpick #1034 for this movie. Why do action movies always pick on the Golden Gate Bridge? X-Men: The Last Stand (2006) and Rise of the Planet of the Apes (2011) to name just two examples. “If you don’t walk out, you don’t come back at all.” Sounds like dialog I would write...in the eighth grade. The battle of the leviathans. Why do they always have to fight in a city? This is an elemental contrivance in this brand of disaster picture. These gargantuan beasts would probably, instinctively, battle out in some vast open space rather than mix it up in close quarters with buildings constantly toppling down on them. Of course, such a battle wouldn’t contain any visceral thrills since no humans would be imperiled by such a colossal confrontation. Why did Godzilla wait until after it got beaten into submission to use its laser breath? The easy answer is that the writers needed to build some tension into the scene, and the only way to do that is to make it appear as if Godzilla might be defeated. Either that, or Godzilla is just toying around with his assailants. Final analysis: maximum destruction with minimum plot. Serves its purpose if a disaster film is on the menu. Although, there are far, far better films in this Thriller subgenre (disaster movie) to watch than this. Rating: 2 out of 4 stars. Edges out Pacific Rim by that much. Needed some humor. Broderick could’ve helped. It’s been sixteen years since the last American Godzilla (1998) premiered; the Japanese produced Godzilla 2000 was released, ironically, in 1999…and was awful. 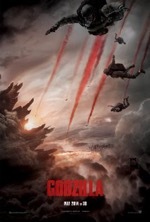 Many people, myself included, felt that the Matthew Broderick version, which featured baby Godzillas thrashing about like raptors from Jurassic Park (1993), had efficiently and effectively killed off the franchise…at least in the West. Although this film is a gigantic lizard leap ahead of the last Godzilla, it’s still riddled with outlandish monsters, dunderheaded strategies for stopping the creatures and a plot that’s consistently servile to the unrelenting barrage of action sequences. There are tons of things to find fault with and poke fun at in the movie, but ultimately, this movie is a squandered opportunity to tell a topical, salient story of how climate change can bring about our doom. The movie also had the chance to deal with the loss of a loved one and the restoration of a strained relationship between a father and son. All of these attempts at foregrounding genuine human emotion are abandoned after the first twenty minutes and then it’s back to business as usual with lumbering behemoths rampaging through our major cities just for the fun of it (and because it’ll serve as fodder for a top selling video game). In place of anything substantive, the movie resorts to the silly brand of monster melee that’s become the hallmark of every Godzilla movie to date. In truth, the only thing I like about this movie, other than Cranston’s presence…however brief, was the “against type” role the titular creature serves in the movie. I only spent $2 on the movie and still feel shortchanged. Watch at your own peril. Nice tropical sounds added to the 20th Century Fox fanfare. The percussive rhythms of Carnival. A blue feather is found in the Amazon. Right next to the nest of raptor eggs. Nice tour of Brazil in a storybook montage. The bird’s-eye vantages of the major cities really help to capture the flavor of this diverse country. Kristin Chenoweth voices the poisonous frog. Call it a significant career change. Just further proof that there isn’t anything she can’t do in the biz. The blue community’s celebration song is brilliantly animated and choreographed. A visual treat that recalls other such elaborately produced numbers in the first film. The jungle talent auditions are hilarious. The male black panther singing high soprano is particularly humorous. Blue insults the Red leader. This means war. Insulted Red Leader? Who does he think he is, Luke Skywalker? Correction: Blu. Fanny Pack single-wingdedly looses the war. Final analysis: a respectable sequel with some new characters and challenges thrown into the mix. While some original characters, like George Lopez’ Rafael, are sidelined for much of the movie. Rating: 2 1/2 out of 4 stars. 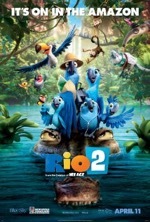 So will the sequel be called Rio 3 or Amazon 2? I’m so confused. Such confusion stems from the fact that the majority of the film takes place in the Amazon—only about the first fifteen minutes of the story transpires in the birds’ native haunts in Rio. Whereas it was the right decision to move some of the action away from the familiar settings established in the first film, the sequel spends too much time away from the titular city and should’ve returned there if only for a closing number to provide an adequate bookend for the film. Indeed, one of the subplots (the proposed talent show) would’ve been a natural, logical way to close out the film…but that plot thread is left dangling in the tropical breeze. The familial aspects work really well here, but the writers work overtime at turning Blu into an avian version of Ben Stiller’s character in the Meet the Parents movies. Seeing the blue bird bumble and stumble through every situation grows tedious after a while and the way his one heroic act at the end rectifies all the damage he’s done all movie long is extremely contrived. And speaking of Blu’s defining moment of valor, does anyone else see the connective tissue between clumsy Jar-Jar leading the Gungan attack against the Battle Droid army in Star Wars-Episode I: The Phantom Menace and Blu leading the charge against the humans and their bulldozers here? This heavy-handed means of vilifying humans is old hat. Though conducted on a much smaller scale, this nature-revolts-against-humans finale is virtually identical to the one in FernGully…The Last Rainforest (1992). Whereas I’m certainly not a supporter of deforestation or any other means by which humanity destroys nature, I’m even less sanguine when Hollywood indoctrinates impressionable minds with its diatribes of evil humans and their careless stewardship over the planet (see my review of “Happy Feet” for a rant on the subject). This “humans bad, nature good” final conflict was the only sour note in an otherwise mellifluous animated romp in the jungle. So the question remains: how much of Rio will we get to see in Rio 3? Those protein blocks don’t look very appetizing...or edible. Imagine having nothing but Jell-O to eat for the rest of your life. Take the engine, take the world. Beware the woman with the yellow jacket and tape measure. Now that’s one brutal form of torture. And the most unique one I’ve seen in quite some time. A poet might term the sequence alarming and disarming. I’ll stick with brutal. “Bullets are extinct.” A risky theory. Evans puts his theory to the test in a startling display of machismo/foolhardiness. The film’s ultimate inciting incident. The protein in the protein bars is disgusting. Revolting, in fact. Just a heads-up in case you have a weak stomach. Night vision melee is nail-bitingly intense. The protracted battle brilliantly morphs in response to changing circumstances. The club car gives a whole new meaning to soul train. A startling confession while smoking the world’s last cigarette. I pray that things never get so bad in our country that such an option becomes a viable one. Wow, that was the mother of all derailments. Final analysis: a bleak, claustrophobic dystopian yarn with much to say about the human condition. On both ends of the spectrum: the honorable and the despicable. Chris Evans has never been better and the supporting cast is stellar. Evans’ physicality was a natural fit for the part, but he developed some dramatic chops here, far beyond what we saw in the Captain America movies. The world inside the train is staggeringly immersive and the production design is nothing short of brilliant. For your consideration: Art direction, cinematography, editing, sound editing/mixing, visual effects, etc. Rating: 3 1/2 out of 4. Amid the myriad remakes & sequels, it’s refreshing to see an original work of sci-fi. 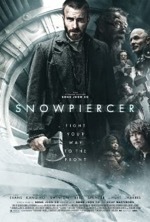 This film is based on the French graphic novel series Le Transperceneige and is directed by South Korean filmmaker Joon-ho Bong (Mother) in his English-language film debut. Bong also directed The Host (2006), which was a Godzilla-style action movie starring Song Kang-ho. With that antecedent in mind, it should come as no surprise that this film boasts highly stylized camera work along with intricately choreographed, furiously filmed and splatter-tastic action sequences. What really sets this film apart, however, is the story’s keen, yet understated, observations on the human condition…especially amid extreme or desperate circumstances. So what we have here is a movie that possesses what every blockbuster/sequel/remake aspires to have but can never obtain…poignant political/social commentary, moral ambiguity, character complexity and, above all, paradigm-shattering originality. The way the characters behave in relation to their status, station or surroundings, the narrative strictures imposed by the habitat’s physical, structural confinement and the furious pacing and trajectory of the story (both train and characters are always recklessly pushing forward) all commingle to forge an unforgettable cinematic experience. We can forgive the numerous gaps in logic (where does the inexhaustible supply of “protein” come from, why do the security guards operate with obstructed vision, why hasn’t the train ever crashed before and how will the human race continue with such a tiny remnant?) for the sake of the highly evocative, innovative and controversial (don’t recall seeing any cows on the train) story. Beyond the thought-provoking story and gratuitous yet gratifying action sequences, what makes this film so mesmerizing is its mélange of visual and narrative elements. This is the epitome of a transnational film: the story originated in France, the director is from South Korea and the movie was shot in the Czech Republic. Add to that diverse foundation actors from South Korea (Kang-ho), Britain (Jamie Bell, Tilda Swinton and John Hurt) and America (Chris Evans, Octavia Spencer and Ed Harris), and you truly have a melting pot of cultures, languages, styles and creative energies. You can call the film’s mood dark, dire and despondent; you can call its world bleak, bizarre and brutal; you can call the story a disturbing, cautionary, post-apocalyptic dystopia on wheels; you can even call it unsettling or confusing, but one thing you can’t call it is boring. How fitting that one of the most original movie titles that’s rolled along in quite some time is also one of the rarest cinematic visual feasts in recent memory. “A roller coaster that only goes up.” Where’s the fun in that? And, technically, is that even a real roller coaster? I mean, most of the enjoyment comes from the drops, twists and turns, right? Actually, Gus introduces her as “Hazel Grace.” Gus’ dad calls her “Just Hazel.” Apologies for the inaccuracy and confusion. Okay is the new always. Gus takes Hazel to a skeleton playground for a picnic. Skeletons signify death…overdetermined imagery considering the movie’s subject matter? The bit about Hazel wasting her wish is very amusing, though. The conversation on the “sad swing set” contains some killer dialog...and some incredibly raw emotion. Gus is told to put out his metaphor on the plane. A non-metaphor flight? Airlines are getting so picky these days. Next thing you know, they’ll have non-humor flights. Oh wait, I’ve been on a few of those. A very unromantic location for the first kiss. Which is the irony of the scene. If Hazel wasn’t breathless after her long ascent up several flights of stairs, I’m sure she was after that kiss. The pre-funeral scene is deeply moving. The line about a “limited infinity” is staggering visceral. Hazel experiences her great and terrible 10. Wow, that last “okay” went through me like an electric shock. As a key ingredient in the title, director Josh Boone cleverly uses stars as a recurring theme/symbol throughout the movie. How fitting that the movie should conclude with Hazel looking up at the starry host with its scintillating beauty reflecting in her eyes. Final analysis: a film preoccupied with death that somehow ends up being life-affirming. A sobering reminder of the brevity of life and the things that matter most in it. Rating: 3 out of 4 stars. Could’ve been melodramatic, but strikes all of the right chords emotionally. Based on the wildly popular book of the same name by John Green, Fault follows a courageous young woman on her mission to discover why she is made to suffer from a terminal condition. Although emotions here are real, and occasionally raw, some will undoubtedly find the more melodramatic aspects of the plot to be unbearably schmaltzy. To those hardened critics I say, “Get a heart!” In my estimation there’s only one scene (mentioned above) that even comes close to being maudlin, and the overall story seems far less interested in trumpeting the injustices of individuals living in the throes of cancer and fully invested in telling an intimate story of one person’s plight and how others in her orbit are affected by her infirmity. The story, adapted by Scott Neustadter and Michael H. Weber, is never contrived or stilted and adroitly avoids the mawkish pitfalls that so many other films of this kind unwittingly stumble into. 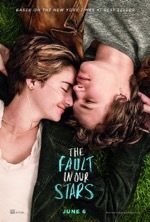 Besides the exceptional performances of the star-crossed lovers, Shailene Woodley and Ansel Elgort, the film’s greatest asset is its dialog, presumably lifted wholesale from the book. I remember hearing one such line in the trailer, “You trying to keep your distance from me in no way lessens my affection for you.” I thought, Wow this is going to make a great movie. Fortunately, my initial assessment of the film holds up thanks to a movie brimming with such great lines and accompanied by genuine performances and a truly touching story. This certainly isn’t an easy film to watch at times, but its veracity reveals the bitter reality that fate can’t be cajoled or controlled. Barring a few sentimental moments, this movie presents an inspiring and heartwarming story that’s really hard to find fault with.